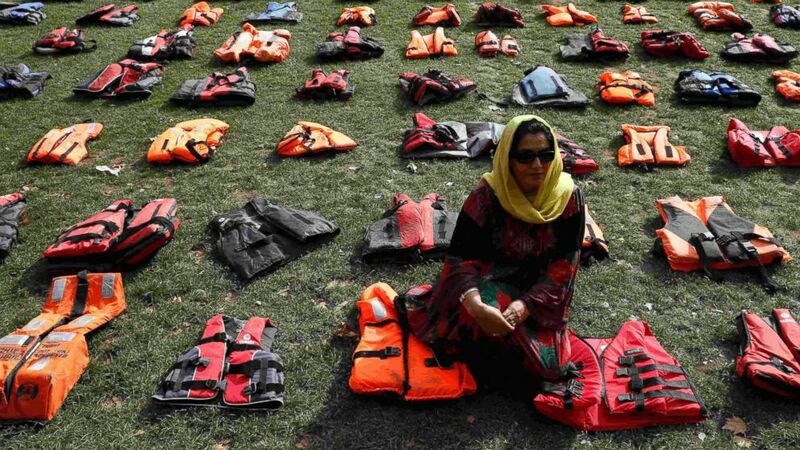 More than 2,500 life jackets worn by refugees were placed in the square. London’s Parliament Square became the site of a "life jacket graveyard" Monday as charities that benefit migrants sought to display the risks faced by refugees in advance of this week's United Nations summit on the refugee crisis. More than 2,500 life jackets were placed by volunteers in the square in front of the iconic Parliament building before sunrise. The display, which includes jackets worn by refugees making the treacherous journey over sea from Turkey to the Greek Island of Chios, got attention from passersby along the busy throughway. The charities involved, which include the International Rescue Committee and Doctors Without Borders, say the display is a visual reminder of the suffering endured by refugees and the need for policy-makers to take action on the issue. "It is unacceptable in this day and age that anyone should have to risk their life in order to reach safety or move across borders," said Nazek Ramadan, the director of Migrant Voice, one of the charities involved in the display. "We call on the UK and European governments to do more to offer sanctuary to those who enter Europe in search of safety and provide safe and legal routes to put human traffickers out of business." (Stefan Wermuth/Reuters) 2500 lifejackets worn by refugees during their crossing from Turkey to the Greek island of Chois are seen in Parliament Square in London, Sept. 19, 2016. According to the United Nations refugee agency, about 281,740 people have crossed the Mediterranean to Europe over the first eight months of 2016. And during the last year an average of 11 men, women and children have died daily making the journey. "The last time I saw these life jackets I was crossing the sea to Greece," said Ahmad al-Rashid, 26, a refugee from Aleppo, Syria, participating in the campaign. "I know of friends and people who lost their lives in the sea after the life jackets betrayed them ... Today we stand here with these life jackets to bring to life their memories and experiences." The United Nations convened a summit on refugees Monday to discuss the refugee crisis at a special session of the 193-member General Assembly. Leaders from around the world will also be meeting Tuesday at a session convened by President Obama aimed at negotiating an international response to the crisis.